Bishop Thomas Olmstead of the Archdiocese of Phoenix recently issued an Apostolic Exhortation entitled Into the Breach. I begin this letter with a clarion call and clear charge to you, my sons and brothers in Christ: Men, do not hesitate to engage in the battle that is raging around you, the battle that is wounding our children and families, the battle that is distorting the dignity of both women and men. This battle is often hidden, but the battle is real. It is primarily spiritual, but it is progressively killing the remaining Christian ethos in our society and culture, and even in our own homes. The world is under attack by Satan, as our Lord said it would be (1 Peter 5:8-14). This battle is occurring in the Church herself, and the devastation is all too evident. Since AD 2000, 14 million Catholics have left the faith, parish religious education of children has dropped by 24%, Catholic school attendance has dropped by 19%, infant baptism has dropped by 28%, adult baptism has dropped by 31%, and sacramental Catholic marriages have dropped by 41%.1 This is a serious breach, a gaping hole in Christ’s battle lines. While the Diocese of Phoenix has fared better than these national statistics, the losses are staggering. 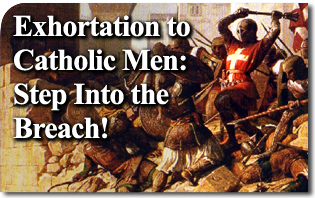 One of the key reasons that the Church is faltering under the attacks of Satan is that many Catholic men have not been willing to “step into the breach” – to fill this gap that lies open and vulnerable to further attack. A large number have left the faith, and many who remain “Catholic” practice the faith timidly and are only minimally committed to passing the faith on to their children. Recent research shows that large numbers of young Catholic men are leaving the faith to become “nones” – men who have no religious affiliation. The growing losses of young Catholic men will have a devastating impact on the Church in America in the coming decades, as older men pass away and young men fail to remain and marry in the Church, accelerating the losses that have already occurred.